Are we achieving our organizational potential in areas like new product development, cycle time reduction, team effectiveness, cross functional coordination, sales growth, stakeholder collaboration, culture change, etc.? Organizational potential is a journey and not a destination. Therefore, strategic clarity, tactical urgency and interpersonal adaptability and trust are THE critical factors to accelerate advancement toward our full potential. Sharing the economics is critical to gaining employee understanding and commitment to achieving the successful implementation of radical change. Here is an example from a former client. Upper management spent many meeting hours worrying over progress in reducing the mean time to break even and the new product development team didn’t understand the concept. They did understand they were over budget and behind schedule, but were preoccupied with a moral/ethical dilemma in that they felt they were being rushed to announce a new product/service that wasn’t ready. Their concerns became more balanced and their recommendations more productive when they understood the cash flow economics. Changing behaviors and culture faster is the key to successfully implementing organizational improvement strategies. This certainly involves trust. When a new process is going to save money, it usually means it will eliminate work and maybe jobs. To try and hide that fact is futile. 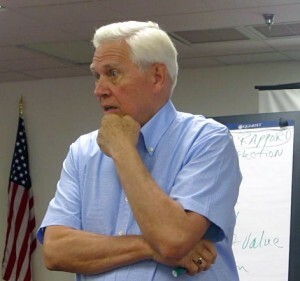 To seek worker input into ideas affecting their future may seem scary but it is the only thing I have ever seen work. During the 80’s and 90’s my company’s biggest client was the Motorola businesses located in Arizona. I had huge respect for the progressive thinking of these leaders in that they were always launching new initiatives to elevate people’s vision and challenge their performance. Six Sigma was certainly one of those. Looking back, my only feed back would be that new initiatives were launched too often; not allowing each to be fully digested and implemented before the next one is announced. 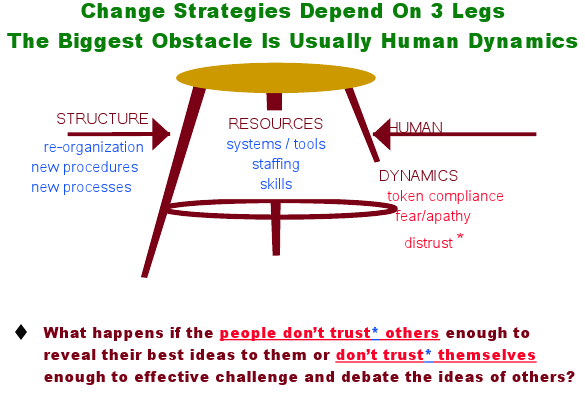 As the following graphic depicts, all 3 legs of the change strategy “stool” must be equally strong (and long) for a successful implementation. Most organizations do a good job on the left and center legs. It is that pesky right leg that must be closely watched. Helping you with the right leg is what I do. The big, dramatic kind of trust starts with self first and then moves to trust of others. I know this sounds confusing, but in simple terms, here is how I see it. Until I trust myself enough that I believe that I can adapt and “handle it” regardless of what you do with my trust of you, I will be reluctant to extend much trust to you. Therefore, the more confident I am in my skills and ability, the more willing I am to extend trust to others. Once trust has been earned by the other person’s reliability and predictability, I will extend more and more trust that may start going beyond my ability to control. My 30 years of experience tells me relevant experience in the technology or market and a solid combination of dialogue combined with persuasion skills are essential ingredients to building self trust. Then I can extend more trust to others in pursuit of our full potential. New initiatives to pursue our full potential are not unlike an advertising campaign. Strategy and tactics must be clear, attitudes must be influenced, skills must be taught, progress must be measured, results must be fed back, partial failures must be acceptable, course corrections must be expected and the standards of behavior are clear and so are the consequences. I want to hear from you and discuss how I can add value to your ideas and/or their successful implementation!